Eridge RDA was started 38 years ago by Mrs Yvonne Coleman and Mrs Janet Hardy Smith who were both active supporters of the local Eridge Hunt and Eridge Hunt Pony Club. Their original volunteers were drawn from these two sources. In 2018 we shall celebrate our 46th Anniversary . 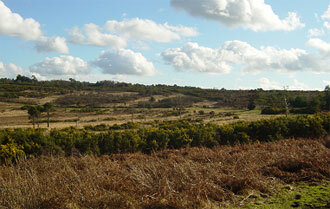 The group has always functioned in or around the Ashdown Forest. The most famous resident of the Ashdown Forest is Winnie the Pooh. AA Milne wrote his famous books less than a mile from our current base. Affiliated to the national Riding for the Disabled Association , Eridge RDA provides riding for children with profound learning difficulties from two local maintained special schools and also for children with special educational needs attending mainstream schools. The riders with the Group include children and adults who have a wide range of disabilities including, sensory impairment. A significant number of the children attending riding sessions have severe social and communication difficulties including autism.All of the children have significant learning difficulties. Our riders are with us for a minimum period of 1 term and in some cases will stay for many years. For those children attending school, riding will be part of the PE curriculum and it may also be a form of therapy. For our older riders, it is an essential feature of their weekly programme which can be very restricted once school age has been exceeded. Each session is led by a trained Instructor and will involve formal tuition as well as games and hacks out on the tracks overlooking Ashdown Forest. The emphasis is not only acquiring riding skills and having fun, but also on re-enforcing classroom activities. Few of our children have the potential to become independent riders but all are able to gain a great deal from the experience. For many their time with us will represent a period of unique concentration and also their only experience of the countryside. Our aim is to enable each child to fulfil their potential on horseback. This may vary from being able to sit unsupported on a pony for 5 minutes to riding a pony independently through a simple dressage test. Each rider will have a minimum of two supporters and many often require three. 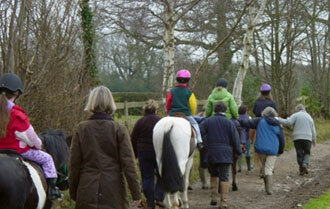 All the Instructors and supporters are trained in horse management and special educational needs. All activities are subject to rigorous risk assessments .Once or twice a year there is the opportunity for some riders to participate in County or Regional Activities. The group is entirely voluntary and all of our funds are secured by fundraising and donations. None of the Trustees are engaged in the horse industry or secure any financial benefit from their involvement with this charity.We are widely supported by the local rural community and the schools with which we work. The benefit of our activities was recognised in a recent Ofsted Report . For each session we require between 12 and 18 volunteers. The group is a registered charity and run pursuant to a formal constitution and national guidelines by a Group of Trustees. For riders and volunteers a like being part of the Eridge RDA Group is a unique and often magical experience, being located as we are a place of childhood mythology and outstanding natural beauty. Why don’t you join us and experience the magic!